Morey's Piers has sent us a press release abot the upcoming closure of their original Giant Slide known as "Wipe Out." The Giant Slide at Morey’s Piers, known as “Wipe Out,” will officially slide into history as a memory following a “farewell celebration” slated for Sunday, October 10, from noon-2 p.m., at Morey’s Surfside Pier, located on the Boardwalk at 26th Street in North Wildwood. The public celebration will include photo opportunities, a “Memory Lane” display of historical images, and an exhibit of future attractions. Morey mascot, Sunny C. Gull, will be on hand, and all attendees will receive a complimentary memorial postcard. Through an online lottery system, 200 lucky sliders will have a “last chance” to slide down the Wipe Out. Also during this time, orders will be taken for a memorial piece of the slide for $50 each, with proceeds being donated to the International Association of Amusement Parks and Attractions (IAAPA) archive preservation fund. 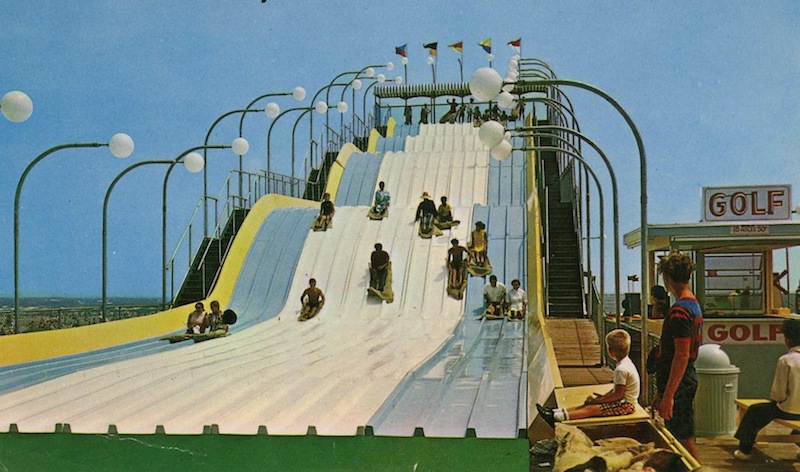 The farewell ceremony will mark 42 years since brothers Bill and Will Morey spotted a giant 12-lane fiberglass slide operating near a shopping center in Fort Lauderdale, Florida, in the fall of 1968. Inspired by what they saw, the brothers purchased a similar ride, called it “The Wipe Out” and officially entered a life long passion in the amusement business. For more information about Morey’s Piers, visit http://www.moreyspiers.com. Last edited by jedimaster1227 on Thu Oct 07, 2010 2:34 pm. I'm sad to see a giant happy fun slide leave, but they ran that one so terribly that I don't think anyone will notice. The last two visits they've only been running ONE lane and it was just a joke. Plus when there are super happy fun slides like the one at Strasswalchen in Austria no other ones can compare! I have been to Morey's 4 times and also have never seen more than 1 lane open, it makes having even a few people ahead of you in line a long wait. I like that design with some space in between the drops more than the newer design that is usually 3 lanes and has a bunch of smaller hills but other than that I won't miss the slide. Here's a video of the event posted on Morey's Youtube. It looks like they were only using two or three lanes. Seems kinda lame to not even open half of them when the whole event was based around the slide. The video also has a short look at the expansion with the coaster model too. They're reporting the coaster won't open until 2013. Yikes. KMG and Rides-4-U have confirmed that a new KMG Fireball will debut at Morey’s Piers, Wildwood, N.J., in March 2011. KMG's Fireball (aka Afterburner) has proven to be quite successful for the Dutch ride manufacturer. The ride, which seats 24 riders per cycle, stands 78-feet-tall and reaches a maximum swing of 120 degrees in either direction. This new example of the popular attraction is expected to be a great addition to Morey’s Piers not only for its reputation with thrillseekers but also for the improved restraint system, which was developed jointly by KMG and engineers from Morey's Piers. This new system replaces the former over-the-shoulder restraint with single lap bars that offer increased rider freedom with the same degree of security. KMG will introduce the Fireball's new restraint system during the IAAPA trade show (booth 4848). For more information, visit: http://www.rides4u.com. ^Wow, lapbars only, awesome!! Something cool to take a look at during IAAPA!!!! I really like the direction the industry has been heading with less terrible restraints! Second, I can't wait to try out a lap-bar-only Fireball! I already love well-run rides of this type, but this rendition might be almost too much for me! TPR's Hairstylist to the Stars! ^Except in Piers case, it would be Fireball Whiskey.